While working with residents of the low-income senior housing facility Sunnyslope Manor to increase their access to healthy foods and active living, Maricopa County Department of Public Health (MCDPH) staff took notice of some commuting challenges. Seniors from Sunnyslope Manor recently took a “field trip” on the Valley Metro SMART shuttle, organized by the Maricopa County Department of Public Health, to determine what challenges the seniors are having when it comes to using the free service (photo courtesy of Maricopa County Department of Public Health). The way the Valley Metro SMART Circulator free shuttle bus was set up, it wasn’t easy for residents to get to and from some spots. Staff from MCDPH partnered up with Sunnyslope Manor and went on a “field trip” with the seniors to see what it was like getting to important places like the Desert Mission Food Bank, where many Sunnyslope Manor residents go to pick up food boxes. Doris Hudson, senior service coordinator at Sunnyslope Manor, accompanied about a dozen residents on the outing. She says one of her responsibilities is to provide educational activities for those who live at Sunnyslope Manor, and this was an opportunity to educate them about the free shuttle. Hudson explains that while the SMART bus stops right in front of the building, many residents hadn’t been using it because they weren’t familiar with the route and stops. This was the “aha” moment that set the wheels in motion for a project that was recently awarded a $14,990 grant from Vitalyst Health Foundation. 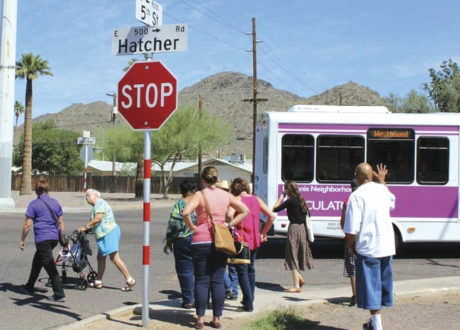 The Live Well Arizona mini grant from Vitalyst will be used to increase usage of the SMART circulator by funding student interns and community health workers who will work closely with community residents to identify their needs, knowledge and awareness of the shuttle bus. This process will help identify any barriers to using the free service. Walkability assessments with residents will help identify environmental barriers, and informational material will be developed. A promotional campaign will be created to help residents understand the opportunities available within Sunnyslope related to care, recreation and healthful eating. The Vitalyst grant is six months in duration, so MCDPH will be busy working with partners including City of Phoenix, Valley Metro, Sunnyslope Manor, Desert Mission Food Bank, and others, to improve access to healthy food and recreation with the SMART circulator. So far, the Valley Metro has been supportive of adding locations to the online SMART Circulator map and is eager to hear more from resident experiences. Over the next few months, MCDPH will work closely with residents to collect the “voice of the community” to drive additional changes.